With many different engagement and diamond ring designs available, micro pave diamond ring photos really highlight the elegance, sparkle, and delicacy of these rings. Pave diamond ring settings encrust the surface of the ring with sparkling gems, and micro pave designs are even more exquisitely delicate. Click on the 'buy now' link for purchasing information on any of the following rings in this slideshow. Depending on the engagement ring design, thirty, fifty, or even more tiny stones may make up the micro pave, but because of their small size, they rarely add up to more than three-quarters of a carat in total carat weight (not counting the center stone). A diamond solitaire engagement ring, for example, becomes even more brilliant than the classic ring design when it is surrounded by brilliant pave set diamonds. Pave settings are popular choices for diamond wedding bands because they add sparkle to the ring without too much embellishment that could detract from the overall ring set. If the band is worn along, the micro pave is all the more beautiful. Dual rows of pave set diamonds can be split around a central gem to add a continuous frame to the jewelry while drawing attention not only to the pave diamonds but also to the beauty of the larger stone. The most detailed micro pave diamond rings will not only have diamonds lining the ring's band, but also along the prongs that hold the center stone. Another popular option is to tip each prong with a small diamond chip. Micro pave settings are often used to add extra sparkle to gemstone rings by surrounding the center jewel with a frame of diamonds. This will not only accentuate the center gem as a focal point, but may also make it appear larger and more elaborate. Wedding ring sets can easily be coordinated with pave diamond settings. Adding pave stones to the sides of the band is another way to enhance the sparkle and beauty of the bands. Smoother Surface: Because the diamonds or diamond chips used in micro pave are so small, the ring's surface is smoother than with larger pave settings. Less Metal Visible: Smaller stones can fit together more closely, eliminating even more metal from showing through the diamond encrustation. Greater Delicacy: Because micro pave rings use such small stones, they can be incorporated into very delicate, intricate designs that are impossible with larger accent stones. Pave settings are popular choices for pearl rings. While a pearl has a rich and luxurious luster, nothing beats the fiery sparkle of diamonds, and a pave setting pearl ring can bring the two together. Pave settings don't necessarily need to complement a center stone. Strips of pave diamonds paired with etchings can be a beautiful and romantic wedding ring design. Micro pave diamonds are especially gorgeous when used in a thin ring setting. The split shank ring design will enhance the beauty of the stones by allowing more light to penetrate the gems, increasing the sparkle. While some pave diamond rings are simple and delicate, others are bolder and more elaborate. Adding pave gems in a halo around the center stone, splitting the pave around the band, and using more than one row of pave stones are all ways to add luxury and beauty to a diamond ring. Micro pave in a gorgeous heart, makes for a sweet promise ring or right hand ring. Colored diamonds can add to the charm and help set off the unique design. Princess diamond cuts are chic and trendy, and pairing the sleek lines of a square gem with the extra sparkle of a pave setting will create an instantly classic and stunning ring. Pave settings are popular on right hand rings because they add a bit of sparkle without being mistaken for engagement rings or wedding rings. 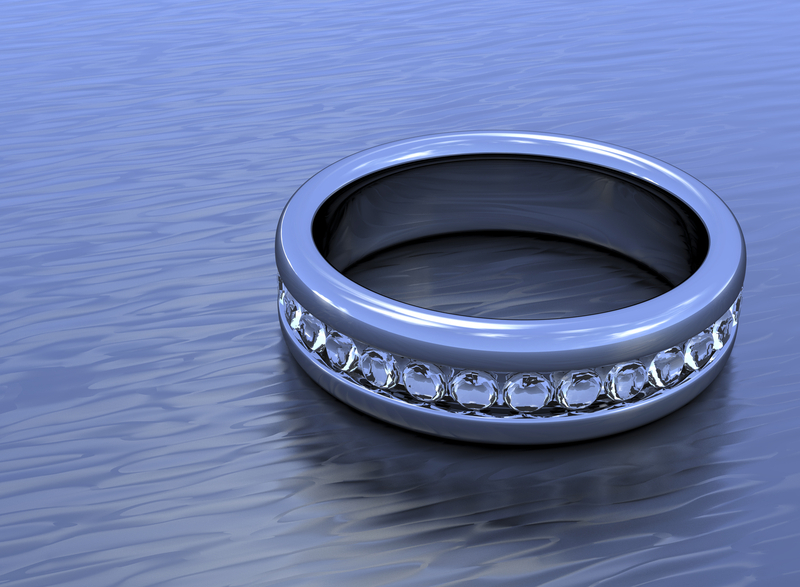 For more information, check out Pave Setting Engagement Rings.